As lovers of all things cheese, wine and bread, Noah and I were super excited to find C’est une Kétouba — a website completely in french for French Jewish couples! After looking through their gorgeous designs (and deciphering what little we know of the French language), we found that this isn’t a brand new artist, but a French extension of This is not a Ketubah — a collective of artists that have been around for a little while… and we’ve reviewed them! C’est une Kétouba contains the same attention to detail, gorgeous designs, and user friendly experience as TINAK’s English site. After a bit of searching, Noah and I couldn’t find any up to date French sites that had the same layout and information as C’est une Kétouba. 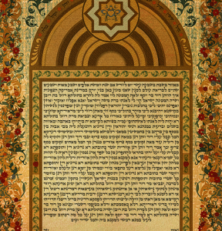 Filled with tons of information and varying styles, TINAK’s French site is the perfect one-stop place for French Jewish couples that want to find the perfect Ketubah to fit their artistic style, language preferences, and general Ketubah concerns. From traditional and simple to more modern or completely unique — C’est une Kétouba truly has it all! We definitely recommend taking a look at their page if you are getting married in France or need to make a Ketubah order in French.